With encouragement from the school’s administration, the Diocese of Springfield’s superintendent of schools and Bishop Timothy McDonnell, Paul and I set up a screening process during which students told us why they wanted to go overseas. “There (in the magazine) were people living out their beliefs, giving up all they could have had…I wanted to understand why,” said Caitlin Rooke. Caitlin was one of nine students—all juniors and seniors—we selected for the mission trip, which I agreed to lead, with the assistance of Phil Paul and two other adult chaperones. We spent 10 months preparing for the trip. While students participated in seminars and get-togethers to get greater insight into mission service overseas, their parents attended presentations aimed at assisting them in supporting their children on their mission journey. Gradually, we discerned that the focus of the students’ service in Tanzania would be teaching conversational English to boys their own age who are students at Bunju Technical School in the capital, Dar es Salaam. From the moment we stepped onto Tanzanian soil to begin our three-week stay, Jesus’ “Come and see!” invitation immersed the students, their three adult chaperones and me in a daily discovery of God’s presence here. 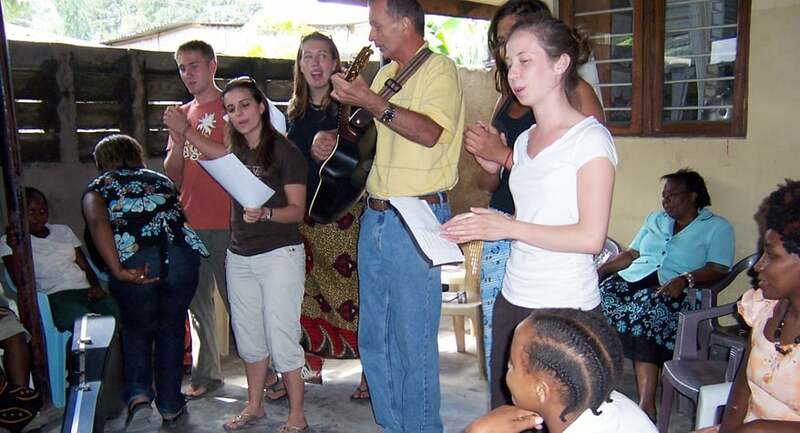 We stayed at a Christian missionary hostel in Dar es Salaam. Each morning two of the chaperones helped the students prepare their lesson plans for the afternoon, when two-by-two (and in one case, three) they would conduct English classes at Bunju Technical School. Each class had eight to 15 Tanzanian students. Working in a poor country, where it is sometimes impossible to adhere to strict schedules, taught Samantha Wright about the need for missioners to be flexible. “I take this opportunity to learn that when God has the steering wheel in life, you will hit the strangest bumps,” she said. The Holyoke students delighted in playing sports with the Tanzanians and getting to know them better. Their hosts’ hospitality, compassion and friendship made up for the “bumps” along the way. At our Eucharistic celebration each evening the U.S. students reflected on the day’s events. Their comments expressed the sense that they were seeing and feeling the “living Gospel” all around us and everywhere we went. Many parents commented on the positive impact the mission experience has had on their children, and all—parents and students alike—said, given the opportunity, they would do it again. Father Robert Jalbert is director of the Maryknoll Mission Education and Promotion Department.